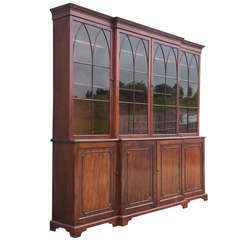 Large antique bookcase made of good South American mahogany. It has eight doors, four glass for display and four blind to hide things, behind which are adjustable shelves. The doors and astral glazing bars are typical of this early period of cabinet making, which is to say that they are as thin as possible to create the impression of space and light. 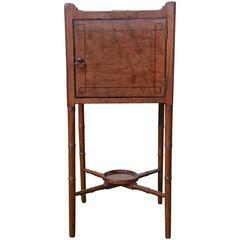 This is an especially fine example of a George III period antique breakfront bookcase. Please enquire for more information or for more photographs. English, circa 1790-1800 09 14 04 Measures: 98 1/2" high max 15 1/4" deep ends at waist 19" deep centre at waist 106" wide max at cornice. This item will be restored prior to delivery if required. The restoration is included in the price but will adversely affect the handling and delivery time.